This microphone stand is of high quality and with a lot of durability. It can be used on different occasions. This product is very popular among universities, schools, artists and bars. Designed to securely mount your microphone stand on top of the table or other flat surface using an adjustable positioning screw. 1 x Microphone Suspension Boom. 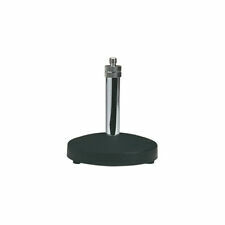 The Mount base can be installed onto the desk up to 55mm thickness. Double-braced arms, morestrengthen, the microphone can be held safely. (Microphone ,Laptop ,WindScreen, Shield Pop Filter is NOT included). Adjust the height by your heart from 240mm to 345mm. Maximum Height: 345mm. 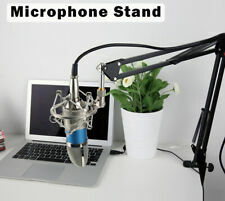 Type: Adjustable Mic Stand. 1 Mic Stand. 180 Degree rotation, each angle rotated freely and stably. Minimum Height: 240mm. Compact microphone stand designed for heavy duty carry. Fit for all kinds of microphones in the current market and designed for heavy duty carry, this microphone stand must be your best assistant in recording! This short microphone stand with a tripod base is designed for mounting microphones and supplied with a microphone clip. 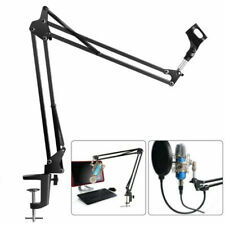 The three adjustable legs can also be used to angle the microphone. The small size of the stand makes it perfect for use when you're out and about in different locations. 1 x Microphone Holder Stand Tripod. Universal mic clip design can fit many mic models. The mic clip can be unscrewed and replaced. This microphone stand is good for using at the conference room,church,the other public place. Tripod Material: Iron & PVC & Nylon. Tripod Weight: 187g / 6.6oz. 1 Mic Clip. 1 Mic Stand. Non-slip rubber feet to protect your desk from scratches. The microphone showed in the pictures is not included. Moreover, the adjustable legs allow you to carry it with you easily and adjust the suitable angle & height to show your perfect voice. Fit for all kinds of microphones in the current market and designed for heavy duty carry, this microphone stand must be your best assistant in recording! Microphone pivots on base to hold preferred position. Noise-cancelling microphone filters out unwanted background noise. Power switch illuminates when microphone is active. 1 x Microphone. Advanced digital USB provides superior clarity with the simplicity of a single USB plug and play connection. Portable Maneuverable Studio Mic Stand Boom Arm Support Fit Blue Yeti Microphone. Featuring both sturdy Arm Stands steel base for enhanced mounting with solid gripping clamp and strong spring holding huge weight that fixes microphone firmly and steadily. This amazing studio set includes all you need to start recording. The condenser microphone with popfilter will ensure pure recording sound without any annoying popping or sibilance sound. With this microphone you can broadcast on YouTube or any similar channel, live broadcasting was never as easy. The studio stand is adjustable into different heights and angles. This studio set is ideal for musicians, vloggers, presentations or vocals. Our online presence were growing on a huge scale. Heavy cast base. of base: 115mm. Height: 100mm. Flight & Rack Cases. Over the course of 2015 DY Pro Cables quickly got a hugereputation for itself for providing high quality products on a very quick service. This short microphone stand with a tripod base is designed for mounting microphones and supplied with a microphone clip. Tripod base for equal balance. Fitted with microphone holder (Mic Clip). 1 x Microphone Desk Stand. Professional scissor arm boom desk mount microphone stand. Desk Top Microphone Stand on Adjustable Round Heavy Cast Iron Base - New! UPRIGHT DESK TOP MICROPHONE STAND WITH HEAVY CAST IRON BASE Complete with 3/8in and 5/8in Fitting. We will always go out of our way to source the product you are looking for. Colour: Black/silver. Max Load: 3kg. 5 out of 5 stars - Desk Top Microphone Stand on Adjustable Round Heavy Cast Iron Base - New! 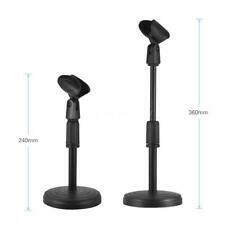 3 product ratings3 product ratings - Desk Top Microphone Stand on Adjustable Round Heavy Cast Iron Base - New! You are able to move the mic where ever you want on the desk and it's steady where you left it. Make sure to tighten the clamp onto a secure surface. The product is strong and well made, it allows to smoothly position the microphone wherever I desire, It easily reaches to your mouth from the back of your desk.